Scoil Naomh Aingeal – St Angela’s Castlebar. 11. Ealaíon Ealaíontóirí na scoile a bhuaigh duaiseanna I gcomórtais, Texaco, an Comhair Creidmheasa agus Cluichí an Chomhphobail. 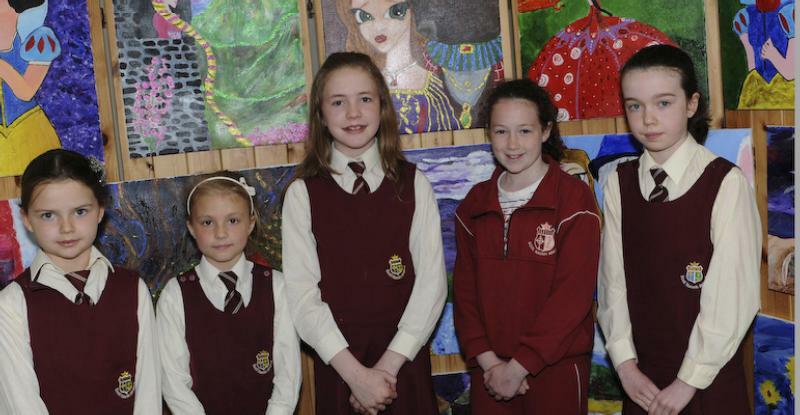 Prizewinners in Texaco, Credit Union and Community Games Art Competitions. Back, Ann Marie Mc Donald, Nicaoimh Jordan, Róisín Gavin, Aine Monaghan, Lana Murray, Saoirse Bourke, Ciara Walsh and Ellen Mc Morrow. Front; Liadh Groarke, Evanna Corley, Muireann Cogan, Clodagh Kavanagh, Katie Walsh, Jodie Canning and Sarah Cosgrave. Photo: Tom Campbell. Scoil Naomh Aingeal – St Angela’s Castlebar. Fleadh Mhuigheo Buaiteoiri i Labhairt na Gaeilge agus Amhránaíocht ag Fleadh Cheoil Mhuigheo.Fleadh Cheoil Mhuigheo Winners progressing on to the Connaught Fleadh in Traditional and Sean-nós Singing as well as Labhairt na Gaeilge Competitions. Back; Rebecca Boylan and Islam Elmahi. Front; Lynn Gaffney, Alison Morley and Dearbhla Mullins. Photo: Tom Campbell. Scoil Naomh Aingeal – St Angela’s Castlebar. 6. Scríobhneóireacht Buaiteoirí i gComórtas Scríobhneóireachta an I.N.T.O. Winners in the I.N.T.O. 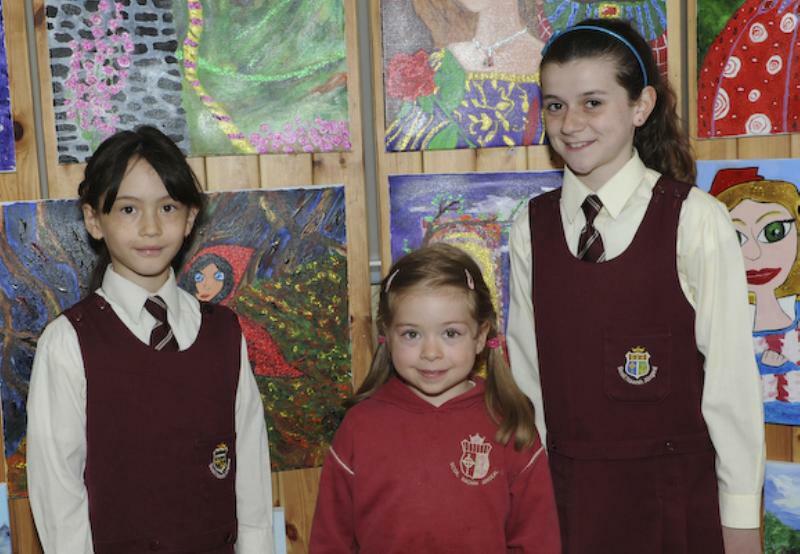 Handwriting Competitions, Norah Doyle, Wioletta Andrzejezak and Kayla Mannion. Photo: Tom Campbell. Scoil Naomh Aingeal – St Angela’s Castlebar. 14. Tráth na gCeisteanna An Comhar Creidmheasa, Trath na gCeisteanna, Faoi 11, Credit Union Quiz Team, U 11, Eavan Cafferkey, Cora Redmond, Eavanna Winters, Shelly Jordan and Nicole Dalton. Photo: Tom Campbell. Scoil Naomh Aingeal – St Angela’s Castlebar. 15. Trath na gCeisteanna An Comhar Creidmheasa, Tráth na gCeisteanna, Faoi 14, Credit Union Quiz Team, U 14, Islam Elmahi, Saoirse Bourke, Sinead Horkan, Lillian Marovatasanda and Dearbhla Mullins. Photo: Tom Campbell. Scoil Naomh Aingeal – St Angela’s Castlebar. 13. 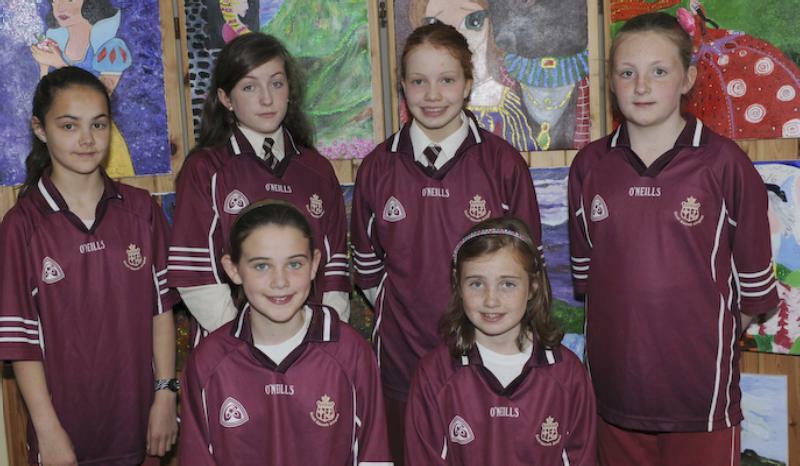 Éalaíon Ealaíontóirí na scoile a bhuaigh duaiseanna i gcomortais an Comhair Creidmheasa, Lara Tolan, Julia Kwiatkowska, Aine Monaghan, Sinead Coll and Sarah Walsh. Photo: Tom Campbell. 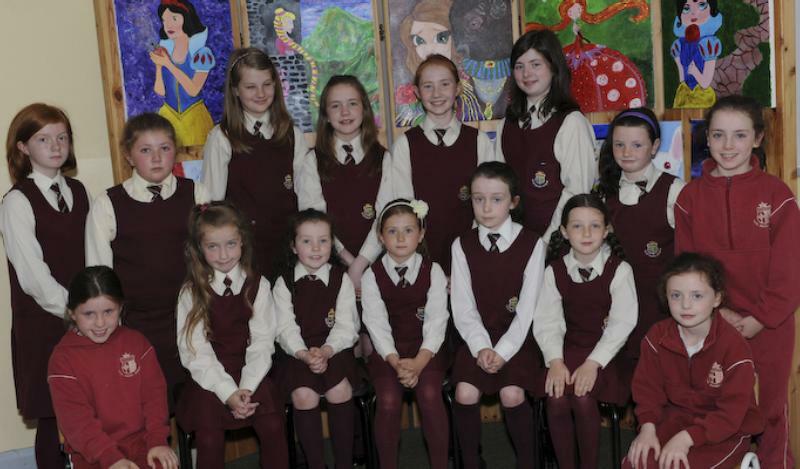 Scoil Naomh Aingeal – St Angela’s Castlebar Prize Winners. 1. Gaelic. Ár bhfoireann peile a ghlac páirt i gComórtas Chumann na mBunscoil. 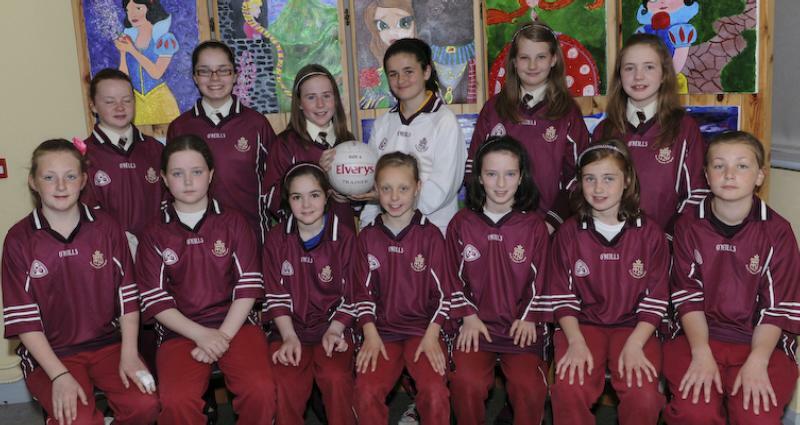 Cumann na mBunscoil Gaelic Football Team, Back, Jean Banson, Aoife Gormally, Ciara O Malley, Ailish Ryan, Roisin Gavin, Aine Monaghan, Front, Leah Horan, Maeve Tolan, Katie Padden, Ciara Middleton, Sian Quinn Bailie, Rachel Lammond and Aimee BaileyPhotoTom Campbell. Scoil Naomh Aingeal – St Angela’s Castlebar. 10. Ealaíon Ealaíontóirí na scoile a bhuaigh duaiseanna I gcomórtais éagsúla, (Farm Safety, Texaco, Road Safety)Ann Marie Mc Donald, Caoileann Gaughan and Alannah Courell. Photo: Tom Campbell. Scoil Naomh Aingeal – St Angela’s Castlebar. 12. Ealaíon Ealaíontóirí na scoile a bhuaigh duaiseanna i gCraobh na hÉireann sna Cluichí an Chomhphobail ; Marianne Ludden a bhuaigh an triú ait faoi 10 agus Sadeem Elhadi a bhuaigh an chéad ait faoi 8. Photo: Tom Campbell. Scoil Naomh Aingeal – St Angela’s Castlebar. 9. Seit Ar nGrúpa Seit a shroich Craobh Mhuigheo i Scór na bPáistí. Mayo Finalists in Scór na bPáistí Set Dancing Competitions. 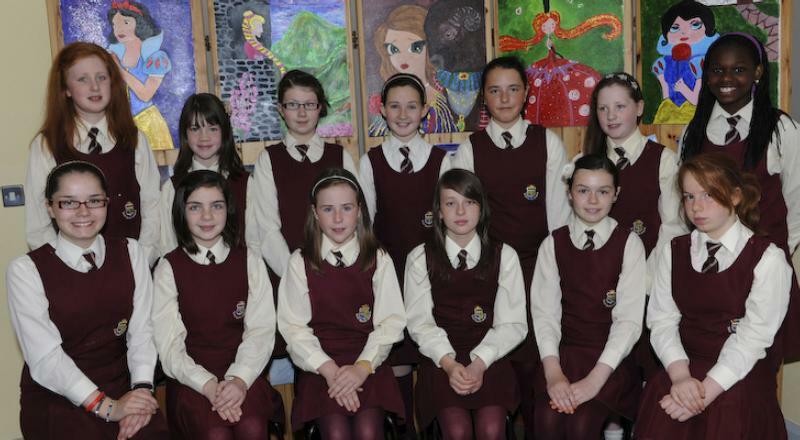 Back, Caoileann Groarke, Alannah Courell, Abbie Waldron, Laura Stenson and Dearbhla Mullins, Front; Ethel Nyland, Lynn Gaffney and Jean Benson. Photo: Tom Campbell. Scoil Naomh Aingeal – St Angela’s Castlebar. 2. Camogie Ár bhfoireann camógaíochta a ghlac páirt sa chomórtas camógaíochta do scoileanna i gCo. 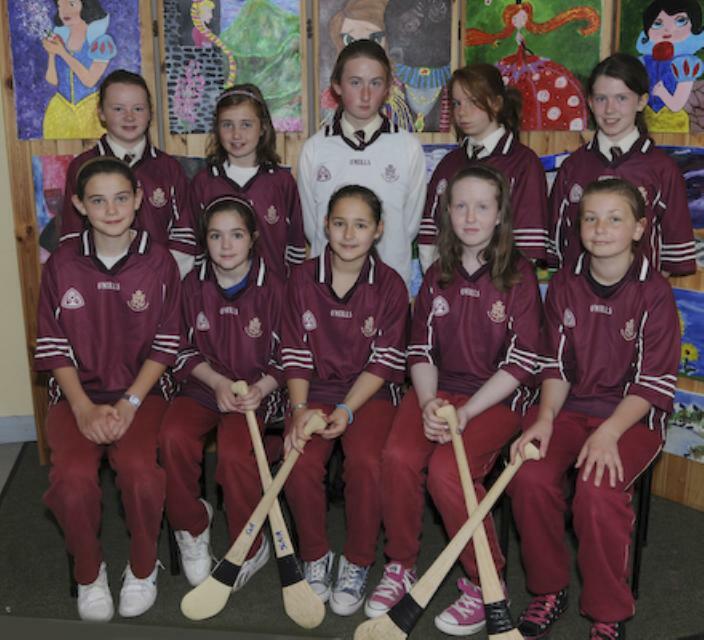 Mhuigheo.Our camogie team, back, Jean Benson, Rachel Lammond, Meadhbh Murphy, Dearbhla Mullins, Alannah Courell, Front, Saoirse Mac Cabe, Katie Padden, Julia Lach, Ciara Mahon and Aimee Bailey. Photo: Tom Campbell. Scoil Naomh Aingeal – St Angela’s Castlebar. 3. Luachchleasaí Ár bhfoireann luathchleasaíochta a bhain áit amach sa chomórtas i gCo. Mhuigheo. Our athletics team, Back, Sarah Fadden, Rebecca Boylan, Edel Egan, Leah Horan. 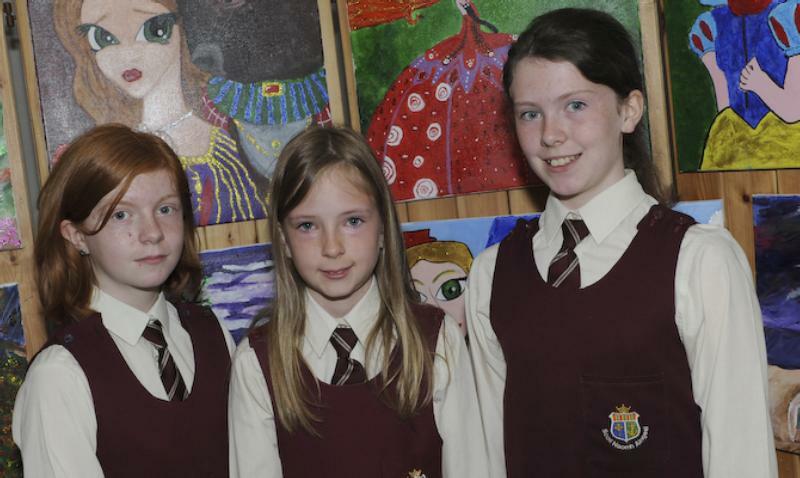 Front; Saoirse Mac Cabe, Rachel Lammond (missing Anna O’ Donovan) Photo: Tom Campbell. Scoil Naomh Aingeal – St Angela’s Castlebar. 8. Ceolteoirí Ár nGrúpa Ceoil a ghlac páirt i Scór na bPáistí. 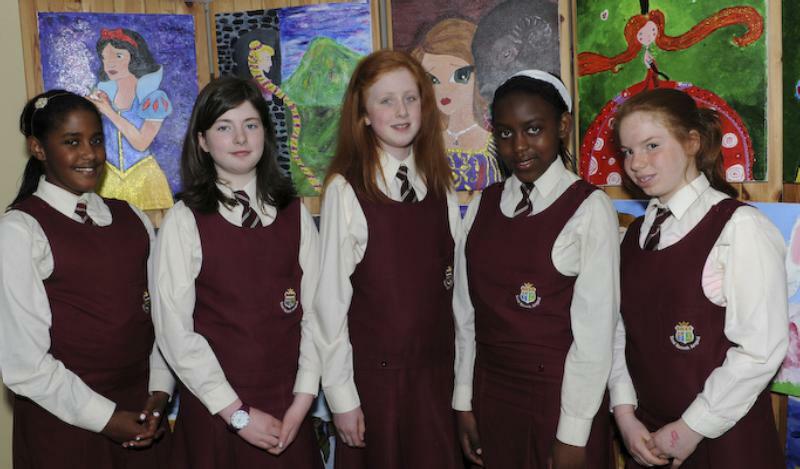 Back, Ciara O Malley, Aine Monaghan, Dearbhla Mullins and Niamh Mc Dermott. 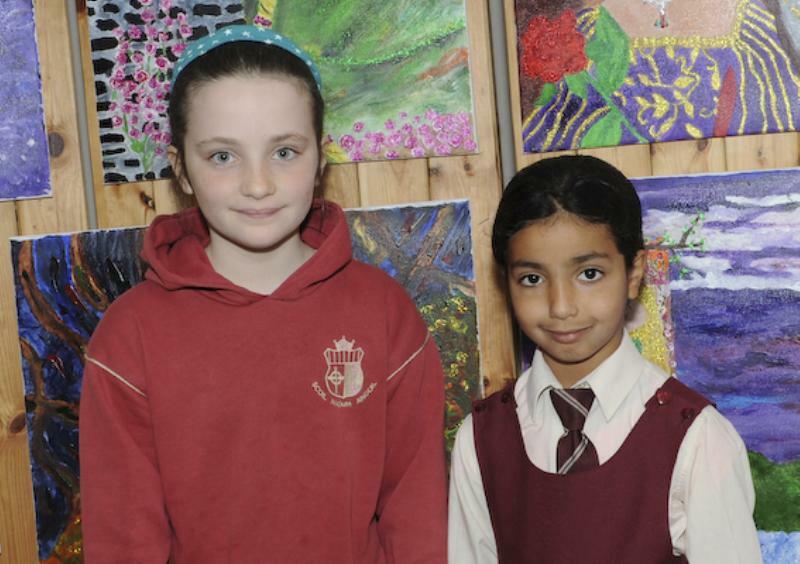 Front; Roisin Gavin and Maedhbh Murphy. Photo: Tom Campbell. Scoil Naomh Aingeal – St Angela’s Castlebar. 4. Snámh Ár bhfoireann snámha a ghlac páirt sna comórtais snámh aonaracha agus an rás sealaíochta sna Cluichí an Chomhphobail. Our Swim Team who took part in the individual and relay team events in the Community Games Competitions, Nicola Connolly, Niamh Egan, Saoirse Mac Cabe and Edel Egan. Photo: Tom Campbell. Scoil Naomh Aingeal – St Angela’s Castlebar. 5. Féile Drámaíochta Buaiteoirí i gComórtas Féile Drámaíochta leis an dráma ‘Pluais na Róin. 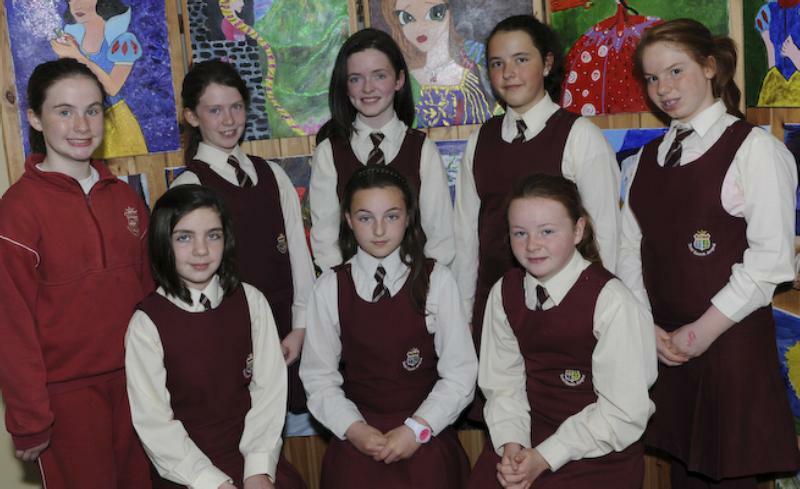 Members of our Drama Group who were prizewinners in the ‘Féile Drámaíochta’ competition. 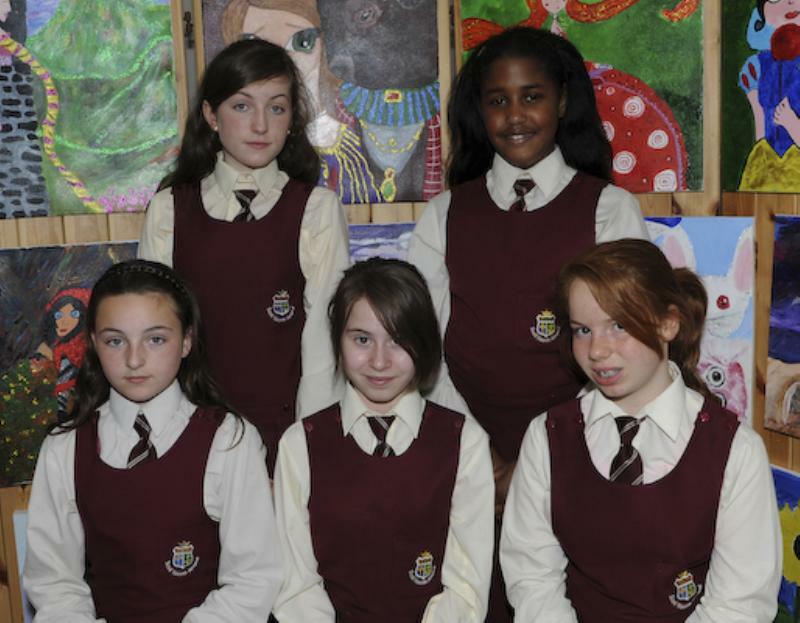 Back; Sinead Horkan, Niamh Mc Dermott, Ali Quinn, Anna Coll, Laura Stenson, Rebecca Whelan and Ayo Anjorin. 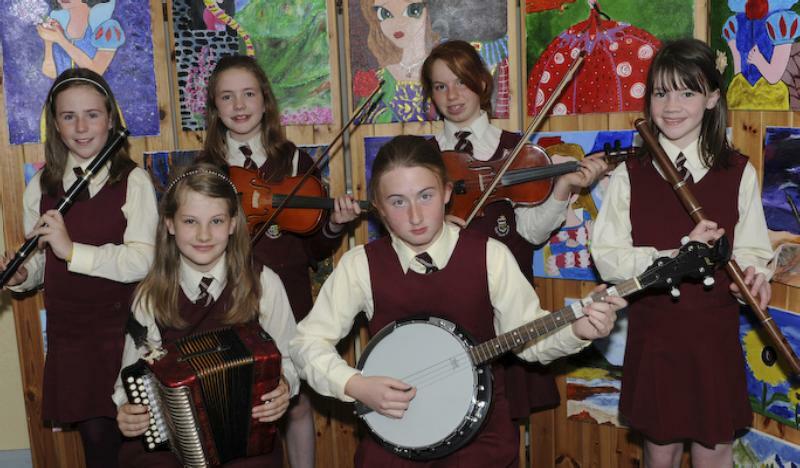 Front; Aoife Gormally, Ethel Nyland, Ciara O Malley, Chloe Burke, Aoife Conway and Dearbhla Mullins. Photo: Tom Campbell.